Tight end Rob Gronkowski announced his retirement late this afternoon. 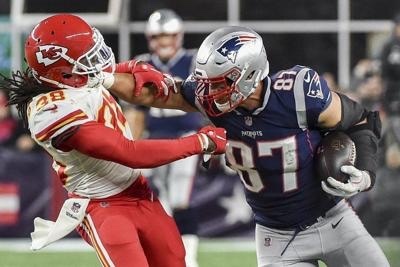 After putting together one of the greatest careers in NFL history, the colorful Gronkowski has decided to call it a career. What a career it was. Gronkowski caught 521 passes for 7,861 yards and 79 touchdowns during his nine seasons with the Patriots. In his prime, Gronk was one of the dominant players in NFL history thanks to his freakish size, athleticism and wide catch radius. He was impossible to defend in the red zone. Injuries caught up with Gronkowski in recent years but despite a down year statistically in 2018, Gronkowski was still a dominant run blocker and a catalyst for an improved Patriots rushing attack. Gronkowski missed substantial time throughout his career due to injury. In 2012 he missed most of the season due to a fractured forearm. In 2013, he suffered a concussion and tore both his ACL and MCL. In 2016, he missed most of the season due to hernia back surgery. He’s had other injuries that are well documented as well. Bottom line, it was time for him to walk away while he could. Rob Gronkowski will not only be remembered as a great player but as a character as well. His free spirited approach off the field was refreshing. He truly was one of a kind. We may never see someone like Gronk in this town ever again.